A quite strong 5.0R rocked North Island near Gisborne this morning. We were expecting yesterday. 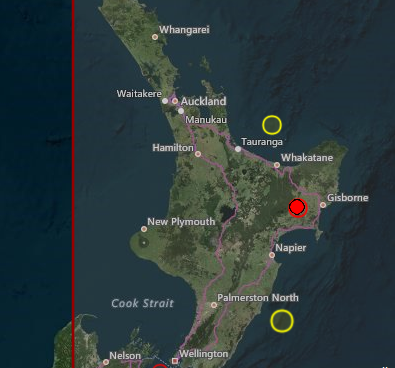 A "severe" magnitude 5.1 earthquake hit near Wairoa in the Hawke's Bay tonight. Almost 1000 people reported on GeoNet having felt the earthquake, which followed a magnitude 4.6 jolt that shook Wellington about 3.20am. GeoNet said the Wairoa earthquake struck at 13km deep at 8.21pm. It was centred 35km north of Wairoa. Wellington's early-morning aftershock registered at a depth of 17 kilometres and its epicentre was 30 kilometres southwest of the capital, about halfway across Cook Strait. More than 1500 people on either side of the strait reported feeling the shake on the government's seismic monitoring website, GeoNet.